The Los Angeles Chapter of the J. Reuben Clark Law Society and the St. Thomas More Society of Los Angeles are co-sponsoring a symposium on “Religious Liberty and the Law,” on Friday, November 3, 2017, from 12:00 to 5:30 pm at the Jonathan Club, located at 545 S. Figueroa St., Los Angeles. The symposium will feature nationally recognized scholars, practitioners, and leaders discussing topics such as the Supreme Court’s religious liberty jurisprudence, pending cases and legal trends involving issues related to religious liberty, and the impact of legal trends and future court decisions on universities and law schools with a religious mission. The keynote speakers will be former U.S. Solicitor General Kenneth Starr and Elder Quentin L. Cook, an apostle of The Church of Jesus Christ of Latter-day Saints. Panelists during the afternoon program will include Margaret Graf, General Counsel for the Archdiocese of Los Angeles; Rabbi Yoshi Zweiback, Senior Rabbi of the Stephen Wise Temple; Bill Atkin, Associate General Counsel, The Church of Jesus Christ of Latter-day Saints; Hanna Smith, Senior Counsel at the Becket Fund for Religious Liberty; James Sonne, founding director of Stanford Law School’s Religious Liberty Clinic; Dean Gordon Smith, BYU Law School; and John Eastman, law professor at Chapman University Fowler School of Law. The symposium will immediately precede the LA Chapter's Annual Dinner, featuring Elder Quentin L. Cook as the recipient of the Distinguished Services Award and keynote speaker. More details about the dinner, including details on purchasing individual tickets and table sponsorships are found here. The J. Reuben Clark Law Society - Los Angeles Chapter 2017 Annual Dinner will be held on Friday, November 3, 2017 at The Jonathan Club in Downtown Los Angeles. 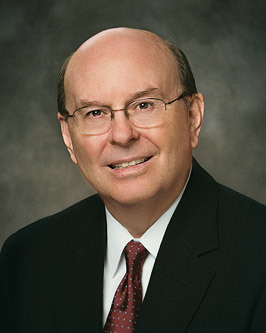 We are thrilled to announce that Elder Quentin L. Cook of the Quorum of the Twelve Apostles will be the recipient of the Chapter's 2017 Distinguished Service Award and featured speaker at the dinner. At the dinner, we will also honor the following individuals for their outstanding contributions: John A. Taylor, Jr., partner at Horvitz & Levy LLP, will receive the 2017 Outstanding Lawyer Award; Brandon Davis, partner at Nossaman LLP, will receive the 2017 Outstanding Young Lawyer Award; and Diana Day Zivich, principal at Landmark Sports Agency, will receive the 2017 Outstanding Legal Professional Award. In addition, for the first time, the Dinner will be preceded by an afternoon symposium on Religious Liberty and the Law, co-sponsored by the JRCLS - LA Chapter and the St. Thomas More Society of Los Angeles. Speakers will include Elder Cook, the Hon. Kenneth W. Starr (former Solicitor General and U.S. Circuit Judge), and many more. Individual tickets and table sponsorships for the dinner are available. Please see the invitation for further details on tickets to the dinner and additional information on the symposium. More details on the symposium to come! The Annual Dinner of the Los Angeles Chapter of the J. Reuben Clark Law Society will be held on Friday, November 3, 2017, at The Jonathan Club in downtown Los Angeles. We are pleased to announce that Elder Quentin L. Cook of the Quorum of the Twelve Apostles will be the recipient of the Los Angeles Chapter’s 2017 Distinguished Service Award and featured speaker at the dinner. You will receive a formal letter invitation and sponsorship information within the next few weeks. We anticipate a great turnout and hope that you are able to attend this exciting event. 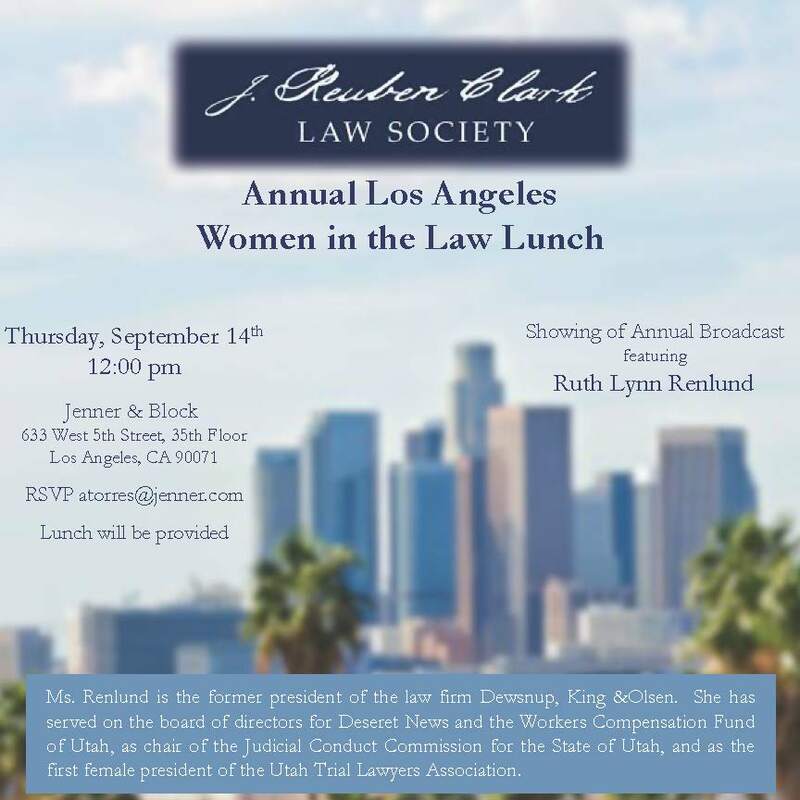 The JRCLS-LA Chapter's next luncheon will be the annual Women in the Law Luncheon on Thursday, September 14th at 12:00 pm. We will be showing a rebroadcast of the JRCLS Annual Fireside featuring Sister Ruth Lynn Renlund, who was also our keynote speaker at last year's Los Angeles Chapter Annual Dinner. 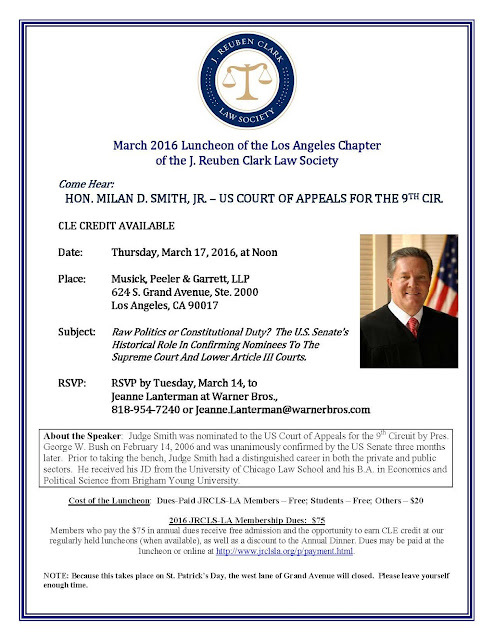 The luncheon will be held at Jenner & Block, 633 West 5th Street, 35th Floor, Los Angeles, CA 90071. Please RSVP with Evelyne Torres at atorres@jenner.com. We hope to see you there! 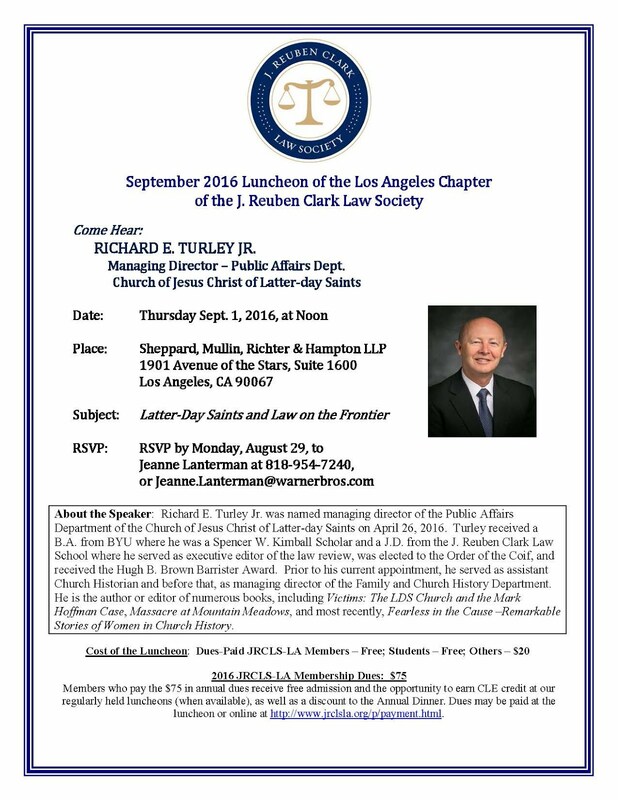 We are pleased to announce that the J. Reuben Clark Law Society - Los Angeles Chapter Annual Dinner will be on Friday, October 28, 2016, at the California Club in downtown Los Angeles. 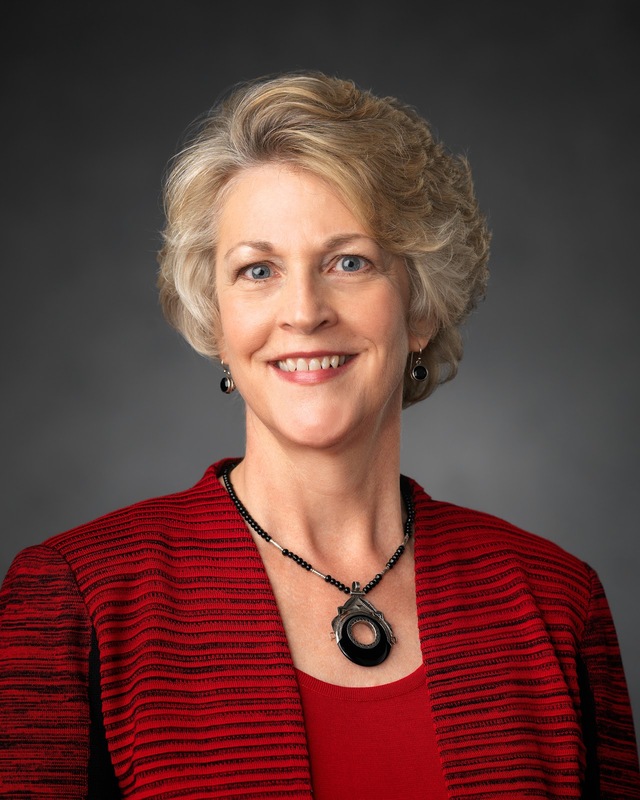 Our Distinguished Service Award recipient and featured speaker will be Sister Ruth L. Renlund, formerly of Dewsnup, King & Olsen and currently serving in The Church of Jesus Christ of Latter-day Saints with her husband, Dale G. Renlund of the Quorum of the Twelve Apostles. We will also be honoring Stephen L. Bradford, partner at Musick, Peeler & Garrett LLP, with the Chapter's 2016 Outstanding Lawyer Award, and Sean McKissick, litigation attorney at Miller Barondess, LLP, with the Chapter's 2016 Outstanding Young Lawyer Award. Attached please find an invitation, along with RSVP forms for table sponsorships and individual tickets. Please return your RSVPs as soon as you can. Thank you, and I look forward to seeing you all at the Dinner! On October 16, 2015, the Los Angeles Chapter of the J. Reuben Clark Law Society held its Annual Dinner at the California Club in downtown Los Angeles and was privileged to hear from Elder D. Todd Christofferson of the Quorum of the Twelve Apostles, who was honored with the Chapter’s Distinguished Services Award. Speaking to an audience of over 200 people, Elder Christofferson recounted the lessons he learned while serving as law clerk to the Honorable John J. Sirica of the U.S. District Court for the District of Columbia, who handled the Watergate trials and proceedings. Elder Christofferson described the famous Watergate scandal, which included President Richard Nixon’s role in covering up his reelection campaign’s connection to the break-in of the Democratic National Committee’s offices at the Watergate Hotel, and which ultimately led to President Nixon’s resignation. From this experience, Elder Christofferson learned that “conscience” plays a critical role in our lives, and that “putting one’s integrity on hold, even in seemingly small matters and for what are usually laudable motives, such as loyalty to one’s friends, places one in danger of losing the benefit and protection of conscience altogether.” Elder Christofferson urged the audience to let conscience “flourish” by leading lives devoted to service, which “provides a natural barrier against the ills and temptations that flow in the wake of self-interest … that is the enemy of conscience.” To read Elder Christofferson’s talk in its entirety, please click here. The Chapter also honored Joseph Ivins Bentley, a retired partner from Latham & Watkins, former Chair of the International Society, and current President of the Newport Beach California Temple, with the Chapter’s Outstanding Lawyer Award. The Chapter also presented its Outstanding Young Lawyer Award to Heather Takahashi, a patent litigator at Munger, Tolles & Olson. Among the prominent guests in attendance were Elder Douglas F. Higham Sr. of the Seventy, Dean James R. Rasband of BYU’s J. Reuben Clark Law School, and several interfaith liaisons who work regularly with the Church’s Southern California Public Affairs Council. Also recognized at the dinner was outgoing Chapter Chair Ladell Muhlestein for her dedicated service and the 2016 Executive Board, which consists of Michael Lee as Chair, David Blood as Vice-Chair, Kelly Crabb as Treasurer, Brandon Vongsawad as Secretary, and Ladell Muhlestein as Chair Emeritus.